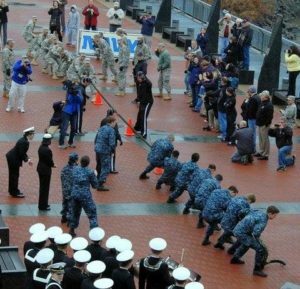 Cadets from Army will face off with the Midshipmen from Navy during a Tug-of-War competition on the pier of the Battleship New Jersey on Friday, Dec. 7 at 3pm. Guests are welcome to attend the competition for free on the pier. Tour the Battleship before the contest and watch the event from the decks of the ship! The Tug-of-War is part of the annual Patriot Games — a two-day, five-event competition between teams of Cadets and the Midshipmen that takes place in various Philadelphia landmarks. Other events scheduled are a Rocky Relay, December 7 at 8:30am at the Philadelphia Museum of Art; the Leadership Reaction Course at the National Constitution Center at 10 AM, the Pull-Up Challenge, December 7 at noon at The Shops at Liberty Place; and the finale on Saturday, with the Stadium Obstacle Relay, December 8 at 1:15pm at Lincoln Financial Field. The Patriot Games lead up to the annual Army vs Navy football game on Saturday, Dec. 8 at Lincoln Financial Field in Philadelphia. Past Tug-of-Wars at the Battleship also featured both academies’ bands, spirit squads, mascots and even an Army tank!